for the past nine months our organization has been planning a huge gala to celebrate the 75th anniversary of the company as well as the retirement of our president after 35 years of service. it has been a very long and exhausting process. 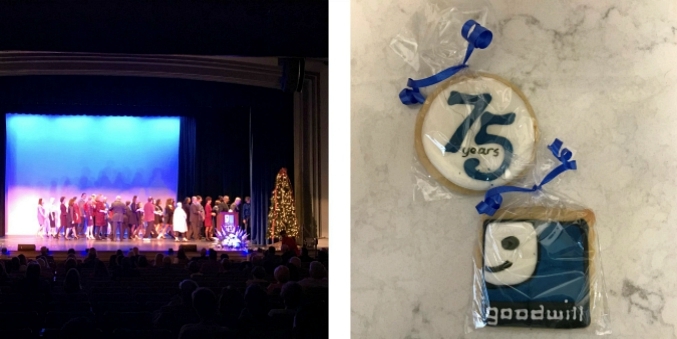 the gala was held on friday night at the theatre and was quite the event! over 300 people came for food, drinks, and entertainment. it was a lot of strategic coordination for our theatre staff in order to pull it all off. i'm beyond glad that it's now over because we can all finally get some sleep. the night was such a crazy mess that i never even got any pictures! i only snapped one photo of the program on stage (which isn't even a good one because it's when everyone was leaving the stage) and one photo of the custom cookies from dessert hour. now onto all of the christmas shows! It went well and everyone enjoyed and had a great time. Relax now and get some rest.